A boy is found brutally murdered and the evidence collected from the crime scene, along with eyewitness reports, identifies English teacher and little league coach Terry Maitland as the man responsible. The problem for detectives? Terry was out of town at a teachers conference with several co-workers willing to back up his claim. With rock solid evidence up against an airtight alibi, Stephen King asks the question: how can a man be in two places at once? Around these parts, it’s no secret that I’m a big fan of mystery, thrillers and crime fiction, however I didn’t care much for King’s foray into that world with his 2014 novel Mr. Mercedes. As a result, I skipped over the following two books that make up his Bill Hodges trilogy. So you can imagine my disappointment when I had heard some rumblings online that there was a connection between The Outsider and the Hodges books. 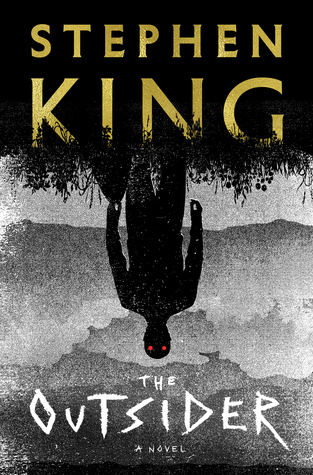 In an effort to dispel those rumors, prior to its release, King tweeted out that The Outsider was in fact a stand-alone and not a Hodges book – and while I suppose that’s technically true, it certainly doesn’t feel like it. It’s worth saying that if you haven’t finished those books and still plan to check them out – DO NOT read The Outsider as it completely spoils them. I honestly don’t know what this book is supposed to be. The first half of this book is some of the best police procedural fiction I’ve read this year. If I had the time, I could have easily seen myself sitting down and blowing through the first two hundred pages in one sitting – it was that good. But as soon as King opened up the door to the supernatural, this story just.. dragged for me, which is a shame because I obviously love King’s spooky stuff, but reading The Outsider is like watching Stan Lee cram The Thing into The Batmobile on that episode The Simpsons – the two just don’t fit together. A review that I had read called The Outsider “an IT for the Trump era”. I understand what the reviewer was reaching for with that comparison, but I feel like that’s putting an awful lot of praise on a novel that has nowhere near the emotional depth of IT. These characters were forgettable cutouts that I could not get invested in no matter what the stakes were – so it wasn’t a surprise that I felt next to nothing following one of the novel’s more explosive scenes near the finale. I know it sounds like I hated this book, but I really didn’t. Like I said earlier, the first half of this book is excellent and an average Stephen King novel is still better than most books, so I still managed to enjoy myself. I liked the overall premise and despite my complaints, I did want to know where things landed when the dust had settled. If I’m being honest – and I can’t believe I’m saying this given my taste – I’m hoping King can move past this fixation of his regarding detective novels. Yes, I know he has a massive back-catalog of books – of which I’ve only read a few dozen -, but I just think he does his best work when he focuses more on characters and less on plot, which is what The Outsider does.